NEW ORLEANS – If collegiate track & field fans have their way, one of the most prolific throwers in NCAA history as well as one of the most versatile athletes to ever grace the NCAA system will take home The Bowerman, collegiate track & field’s highest honor. 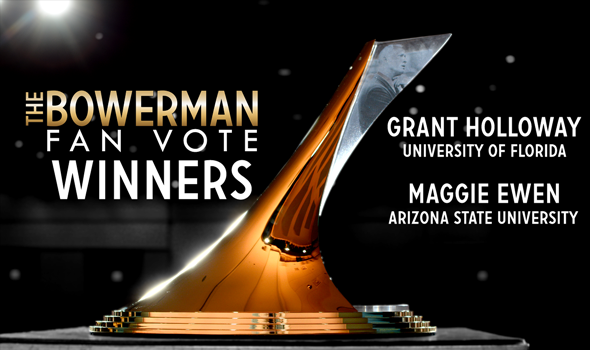 Arizona State’s Maggie Ewen and Florida’s Grant Holloway won The Bowerman Fan Vote following a frenzied voting process. Ewen and Holloway both receive one first-place vote in the overall count, which also includes ballots from The Bowerman Advisory Board, past winners, members of the U.S. Track & Field and Cross Country Coaches Association (USTFCCCA) as well as select media personnel, statisticians and collegiate administrators. Voters turned out in droves for all six finalists as previous Fan Vote records were demolished. A grand total of 65,038 votes were cast for the women, which crushed the former all-time best of 41,266; 45,586 votes were cast for the men, which bettered that high-water mark of 41,683. Ewen, who won the Women’s Fan Vote with 37.8 percent of the overall tally, knows a thing or two (or three) about breaking records and winning titles. The two-time finalist for The Bowerman saved her best for last as she became the first woman since 2009 The Bowerman winner Jenny Barringer to simultaneously hold at least two collegiate records in two different individual events and was the first woman in the past 18 years to win NCAA DI outdoor titles in the discus and shot put in the same season. Ewen bettered her own collegiate hammer record to 74.53m (244-6) in early April and then toppled Raven Saunders’ outdoor shot put standard three weeks later. When all was said and done, Ewen ended up with 13 combined all-time top-10 marks in the indoor/outdoor shot put and hammer, including seven alone in the outdoor shot put. Ewen is the first thrower to win the Women’s Fan Vote and did so with the second smallest ratio of votes cast. She is also the fifth woman from the Pac-12 to earn the Fan Vote crown joining Oregon’s Brianne Theisen in 2012, Stanford’s Kori Carter in 2013, Oregon’s Laura Roesler in 2014 and Oregon’s Raevyn Rogers in 2017. Georgia’s Keturah Orji, who captured three NCAA titles in 2018, scored 38 NCAA points and broke the indoor and outdoor collegiate records in the triple jump, finished runner-up with 33.4 percent of the vote. Kentucky’s Sydney McLaughlin, who broke the collegiate record in the 400 hurdles and finished in the top-4 of the seasonal best lists in each of the six individual events she contested as a freshman, was third at 28.9 percent. Holloway ran away with the Men’s Fan Vote from the jump, never dropping below the 45-percent threshold. His final ratio of 47.9 percent was the second largest winning total in Men’s Fan Vote history behind Deon Lendore’s 52.7-percent victory in 2014. The sophomore standout was sublime in his second collegiate season. Holloway swept the short hurdles titles at the NCAA meet and established five total all-time marks in those events, including the collegiate indoor 60-meter-hurdles record of 7.42 and the second fastest time in collegiate outdoor history of 13.15 in the 110-meter hurdles. He also finished runner-up in the long jump at the NCAA Indoor Championships and starred on the Gators’ 4×100 and 4×400 relay teams. All told, Holloway competed in seven finals in three different disciplines at the NCAA Championships and totaled 32¼ points for Florida. Southern California’s Michael Norman, who broke the world indoor record in the 400, unified the collegiate records in the same event and helped break the collegiate record in both the indoor and outdoor 4×400 relays, finished second with 37.3 percent of the vote. Fellow Trojan Rai Benjamin, who matched the second fastest time ever run in the 400 hurdles (47.02) and clocked two sub-44.40 second splits to help Southern California break those relay records, took third in 14.9 percent. Winners of The Bowerman, collegiate track & field’s highest honor, will be announced Thursday, December 20 at the annual USTFCCCA Convention in San Antonio at the JW Marriott Hill Country Resort & Spa. Votes are tallied by an independent accounting firm. The Bowerman, which debuted in 2009 and is named after former University of Oregon coach Bill Bowerman, is presented annually by the USTFCCCA to the most outstanding male and female collegiate track & field athletes in the nation. Past winners include two-time Olympic gold medalist, five-time World Champion and decathlon world-record holder Ashton Eaton (2010), two-time Olympic medalist Galen Rupp (2009), Olympic gold medalist and 2013 100-meter hurdles World Champion Brianna Rollins (2013), Olympic bronze medalist and 2011 IAAF World Champion at 1500 meters Jenny Simpson (2009) as well as two-time Olympic medalist in the high jump and 2015 World Champion Derek Drouin (2013). Bill Bowerman served the sport of track and field in numerous ways. His leadership as president of the USTFCCCA’s predecessor organization, the National Collegiate Track Coaches Association, and his contributions to NCAA track and field and the running community as a whole are among his many lasting legacies. The U.S. Track & Field and Cross Country Coaches Association (USTFCCCA) is a non-profit professional organization representing cross country and track & field coaches. The organization represents over 10,000 coaching members encompassing 98% of all NCAA track & field programs (DI, DII, and DIII) and includes members representing the NAIA, NJCAA as well as a number of state high school coaches associations. The USTFCCCA serves as an advocate for cross country and track & field coaches, providing a leadership structure to assist the needs of a diverse membership, serving as a lobbyist for coaches’ interests, and working as a liaison between the various stakeholders in the sports of cross country and track & field.